While areas just north of Madison are currently getting hammered by a snowstorm, those of us in the city are sitting through a very early thunderstorm. It's a little eerie, because it seems premature and could easily turn into crazy bad ice later on - but it also gets me to thinking about spring. You see, I'm going a little bit stir crazy, wanting to get out into the world for some serious biking and general wandering. It's a good way to find hidden street art gems, and Madison is usually pretty rife with artsy stuff during the warmer months. Winter can be somewhat barren, though. And that's why I'm a little jealous of Chicago right now, as they keep having cool (indoor) street art related events. 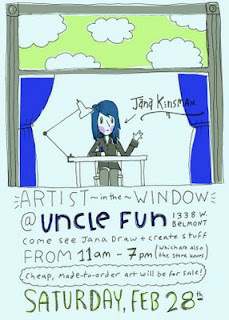 The flier you see up there is for something called "Artist in the Window" and is coming up this Saturday. If you're in the neighborhood, you should definitely stop by to check it out. Seems like a fairly straight-forward instance of "true" street art. Tipster Q had this to say about it: "'Artist in the Window' is truly street art, involving not just display but also creation of art on the street. 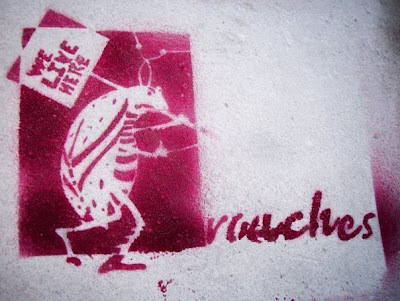 Furthermore, it's street art beyond the reach of various 'authorities,' like politicians and cops, who self-righteously disdain and seek to destroy street art." This isn't directly related to Madison, but I find it interesting and relevant to what this blog is all about: Shepard Fairey was arrested in Boston while on the way to his art opening, based on warrants issued for old street art he'd allegedly put up. Fairey is the artist behind the blue and red Obama "Hope" poster, among other things. He's also currently dealing with the AP's (pretty ridiculous, IMHO) suit against him for alleged copyright infringement. He based aforementioned poster off an AP photo, but as far as I can tell, this is pretty clearly an instance of fair use, not infringement. It ain't easy being an artist. What do you think? Is this a case of someone being targeting simply for becoming a more prominent figure, or do these people have legitimate greviences against him? Even under all of the snow and ice, a little insectile color shines through. Now that the days are slowly getting longer, too, I may have more time to wander the side streets with my camera, looking for hidden art. Well then, happy Imbolc! And thanks to tipster A.S. for taking the photo and sending it in.